We are very proud to have the first Sorraias and Sorraia Mustangs in Austria and in the coming years we hope to build up a small herd of these very rare Iberian wild horses. 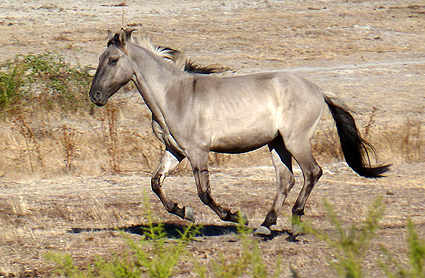 Sorraias are a unique breed of wild horse that is genetically similar to the now extinct Tarpan. Today, there are only around 200 Sorraias in the world; most of them are in Portugal and Germany, and a few are in North America. Working together with other breeders, we hope to increase the world population of Sorraias and help protect them from extinction. I am delighted to be able to make a significant contribution to the preservation of this important equine sub-species that is of great value to Portugal and the whole horse world. The Sorraia Horse is one of the last surviving wild horse sub-species in Europe. Our dream is one day to find a suitable area of land where our Sorraias can live as a free roaming herd, just as their ancestors did.